Step out of the shower and on to the plush, luxurious feel of this shag chenille bath math from Resort Collection. 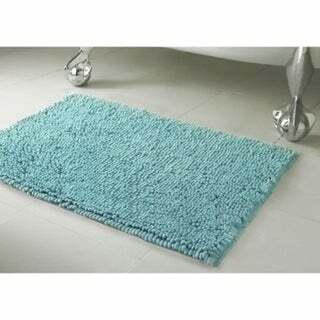 This polyester bath rug absorbs water, dries quickly and features a non-skid backing for safety. With eight different color options, matching your existing bathroom decor is sure to be a breeze. Very disappointed with this 21 x 34 Plush Shag Chenille Bath Mat, as well as the 17 x 21 of the same, also ordered. I ordered the Linen color, thinking from the picture and name, it would be a neutral medium beige. However, I was wrong as Linen turned out to be more in the brown family, perhaps cocoa better describes it. Not what I needed. Also, the height, or pile, stated in the description to be 0.5 inches was higher than that, posing a trip hazard in my bathroom. Already have enough problems without setting myself up for even more falls! This bath rug is a solid purchase. Soft, plush and absorbent. The color perfectly matches the blue of my decor around the apartment. The picture depicts a slightly more blue tint but, with the lighting in my apartment it appears to have slightly greenish hue. Super happy with this bath rug. The color of the rug is exactly what I wanted -- a soft dove grey, just as shown in the pictures. Honestly, I didn't expect it to feel so good underfoot -- it is nicely deep and squishy, and appears very absorbent. Plus, it's non-slip. I can't speak to longevity yet, but at least initially, this is a winner! This has to be the most luxurious bath rug I have ever owned! It feels wonderful as you step on to it after your shower. It looks an feels very expensive. I would definitely by another one! Nice quality and color selection. Soft and comfortable on the feet. I've paid more for lesser quality bath mats. I will be sure to buy from here next time! Perfect color & feels nice on my feet. Adds the pop of color I needed! Very nice. Good quality, super soft to stand on. Very pretty but snagged easily. I bought this for my son away at college. I'm in Colorado and he's in Cleveland. The delivery happened without a hitch and he's very happy with the bath Mat. Like this mat. Soft and good quality.